1880s Tintype - Saloon Bartender? At a camera show a couple years back, a small tintype caught my eye. 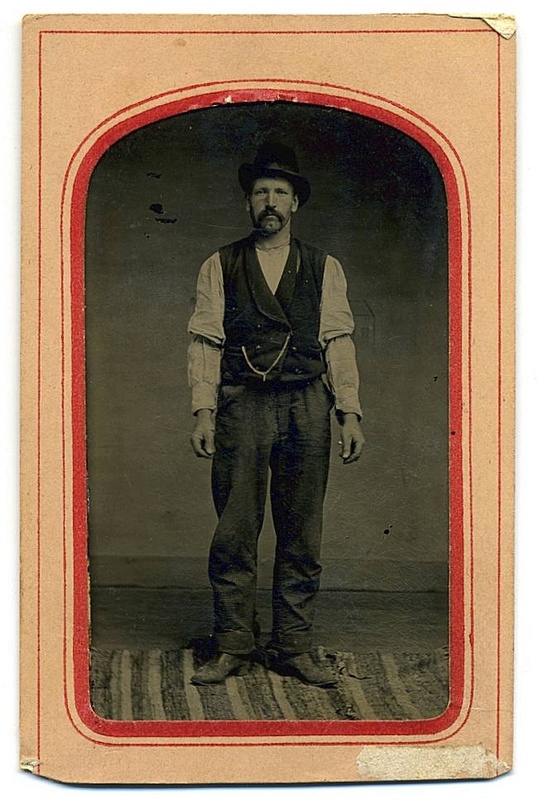 I don’t usually collect pictures of anonymous people, but the image dealer and I mused if this could have been a saloon bartender by the look of his western attire of cowboy boots, vest, hat, watch fob, and what appears to be armbands under gathered shirtsleeves. We didn’t come to any conclusions, but it was a lively and enjoyable conversation trying to guess who this person might be or his occupation (and that he could probably handle himself in a brawl). But it's another nice 'go along' with the early tintype cameras in my collection. I went thru a period abt. 20 yrs ago of collecting old tintype photos of folks I didn't know, they decorated my walls proudly along with my own favorite B & W's, I even had names for them.....a move and lack of wall space prohibits displaying them now, but, I wonder if someday when my son goes thru my possessions if he will wonder who his long lost relatives are !! Hi sbancroft and vetraio50 ... thanks for the comments. Maybe I'll find a tintype that looks like Robert Redford and tell my family that Butch and Sundance are relatives! Love this! I collect old photos and have more of people I don't know hanging on the walls than I do of people I do know. I feel kind of bad for the people in the photos whose families/friends discarded or lost them. I guess I feel like I'm rescuing them. Don't think I would go in the bar if I saw that one behind the counter! Interesting how we can look at the same image and see it differently. I first noticed his hat and the fact that his sleeves were pulled up and held in place by the arm bands. My first thought was that perhaps he was a dealer at a card table. Thanks, fhrjr2! Great observation that the person could be a card dealer. What do other CW'ers think? Thanks ttomtucker, valentino97, southcop, and Radegunder! I've got him pegged for a ragtime piano player in a rough saloon. I would love to frame him and hang it up on my wall. I have framed a lot of people I don't know because something of "character" shows in their expressive faces, and they are set on display cabinets along with something they would recognize from their day set alongside the photograph. *for instance, a small wooden butter press next to a strong, sturdy looking salt of the earth lady, a fancy tea cup, nearby a high class lady of 1900, a small toy next to a well dressed little brother and sister, etc. These are beautifully framed and on shelves in the living room. I feel inspired by them.